Homes with gas lines beneath slab foundations -- commonly built in Palo Alto in the mid 1900s -- are at risk of gas leaks similar to that which caused a Maureen Avenue house to explode last September, fire officials said. Photo by Paul Sakuma. 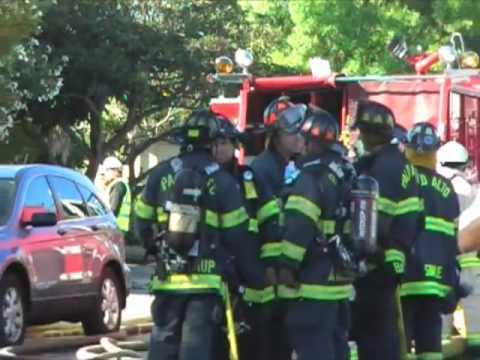 Homes with gas lines beneath slab foundations -- commonly built in Palo Alto in the mid 1900s -- are at risk of gas leaks similar to that which caused a Maureen Avenue house to explode last September, fire officials said. Acting Palo Alto Fire Marshal Gordon Simpkinson said corrosive action of soil can lead to leaks in 50- or 60-year-old gas lines. "If (homeowners) don't take care of it, it could reach the point where it causes a problem similar to what happened on Maureen," Simpkinson said, adding that, if residents smell gas, the Utilities Department has a program to inspect homes free of charge. Such leaks are most common in Eichler-style or similar homes with gas lines under slab, popular in Palo Alto housing developments in the middle of the last century, he said. Before their Maureen Avenue house literally exploded last September, Andrew and Yvonne Ware had consulted with their furnace installer about a natural gas-like odor. The installer, from the now defunct Dahl Plumbing, did not smell natural gas and told the couple the odor probably emanated from a dirty-diaper pail, the Wares told fire inspectors. On Sept. 30, Andrew Ware was finishing up his morning shower when he heard a big boom and saw smoke, flames -- and blue sky where his bathroom roof had been. He escaped the burning home through a bathroom window. Yvonne Ware already had left to take the couple's child to day care. Investigators determined the fire had been fueled by a gas leak. "That's the only thing that can lift the roof of a house like that," Simpkinson said. However, inspectors listed the fire as "undetermined" in their final report because they were unable to pinpoint precisely the source of ignition. They speculated it could have been a water heater cycling on to supply hot water during the shower. Another possible cause could have been the thermostat of a wall furnace. Inspectors estimated property loss to be $375,000 in the Maureen Avenue fire, with another $100,000 in contents loss. The fire, which quickly consumed most of the house, could be seen from the sixth floor of City Hall, more than three miles away. For residents concerned about possible gas leaks, Simpkinson said, "The first thing people should be aware of is that the City of Palo Alto Utilities has a very good free program for investigating any gas odors. "If somebody's got something where they occasionally smell it, they're not quite sure, they can call the Utilities Department and they will come out with gas-detection equipment and go through the house room-by-room. This is free of charge to the homeowner." However, if residents notice a strong smell of gas, they should call 911 and the fire department will immediately come and turn off the gas, Simpkinson advised. For easier repair, leaky underground gas lines can be disconnected, capped off and re-routed through garages or walls, he said. Yes, they will come and find your leak for free, but they won't FIX it. For that, you need to call another plumber. Then call the city and they will turn it on again, when they get around to it. What number to call for free gas detection? Sorry, don't know the actual phone number, but you can call the city communication center and they'll help you. Also, resident is correct about the procedure. The city will detect a leak, but not fix it. The city's liability runs from the gas main in the street to the meter(usually on the side of the house). Everything after that is the homeowners'problem. The city will provide gas leak detection services; unfortunately, most skilled detectors have retired or moved on. The first thing to do if there is a strong odor of gas in your house is to get OUT. Do not use the phone or turn on/off lights. GET OUT and then call the City. Any spark can ignite the right combination of gas and oxygen. I don't know what Sonny is talking about, that "most skilled detectors have retired or moved on". If there is a gas leak on the customer side of the meter, the City will turn the gas off. There is no question about doing that. It is required by the DOT. Then, yes - a private plumber will have to be called in to locate and repair the leak. And that is because the City cannot repair privately-owned pipe. Then the City makes sure that the pressure test has been done, the repairs have been completed and re-lights the pilots. Is there any reason that anyone could possibly have for not taking these precautions? No! Anyone can have a pressure test done on their gas lines by a plumber. A gauge is put on the line after the meter, appliances shut off, and air is pumped in. If pressure is lost, there is most likely a leak somewhere. But, please - if you ever smell gas, inside or out, call the City right away. Better safe than sorry. I just called the city and they told me there was no program whatsoever. They said that once a year they check outside pipes but have no program to check inside a house. I just clarified this with Dean Batchelor of the Utilities Department. The program is intended for people who think they smell gas in their homes. Call 650-329-2579 if you smell gas. There is no program! If a person smells gas, they can call the City to find out whether it is on the City side or the customer's. If they lived outside of PA, then they would call PG&E. The DOT only requires that owners of gas distribution lines do a leak survey every five years, unless it's in a business district or other certain circumstances. The City has sent out instructions for calling in gas odors over and over in utility bills that (apparently) not many people read. If you smell gas, take it seriously and call it in. Just a random fun fact: some "plug in" natural gas alarms that are bought in hardware stores are somewhat notorious for false alarms when exposed to natural sources of human or pet generated gas...that's right, the methane in flatulence can set off the alarm. It's therefore important to install your detectors in an area away from spurious gas sources (i.e. not right next to the kitchen stove or your pet's bed) but not so far away that no one will hear the alarm when it sounds. No one is suing the heirs of Joseph Eichler for this? I'm surprised. Lawyers seldom miss such an opportunity. Is it true that even flipping a light switch can cause a fire or explosion if the electrical wiring is old/ragged/dusty area...?? or is that just re: GAS heaters? I presume the underground gas lines would also apply to Stearns & Foster homes since they also have flat roofs. Anyone know? They all have slab floors but in some cases pitched roofs. Most switches, including relays and thermostats, make a minute spark when turning off, and less so when turning on. It's a crap shoot whether the concentration of gas within the switch body is within the explosive limits, but it only takes once. The odorant added to natural gas is there for a purpose. Believe it! When the Palo Alto planning pushes for historical preservation of Eichlers does it force permit applicants to inspect their underground gas lines? The original Eichlers burn very quickly because of the lack of fire barriers. A plumber can easily pressure test the line to check for leaks. Takes about 1/2 hour. I think the Maureen house was a Stern and Price, commonly referred to as an "Eichler style" home. The early Stern and Price houses in South Palo Alto (mostly on Emerson, Ramona, and Waverley between Loma Verde and East Meadow, and then along and off Cowper near Mitchell Park) pre-dated the Eichlers. They, like Eichlers, were built on slab foundations, but had sheet rock instead of the mahogany that was such a fire hazard in the Eichlers. Thank you LN I meant Sterns & Price not Stearns & Forster. Along Louis and Bibbits you have both Abercombie & Fitch homes and Brown & Kaufman (I think that's their names). On Sutherland, South Court and Bryant you have Williams & Burroughs homes (that's mine). All these pre-date Eichler, in fact Williams & Burroughs went bankrupt and sold the rest of their building sites to Eichler who came later. People tend to use the Eichler name generically but other companies were building in the early 1950s before Eichler and using slab floors. A half hour gets no more than a sniff A proper test requires disconnecting all appliances and pressurizing the line to 10 PSIG and observing a pressure gauge for at least an hour. No pressure drop is acceptable. When appliances are reconnected check connections with soap solution. If you are really concerned about in-house gas leaks, call a California licensed plumbing contractor. The city only handles gas leaks from the gas meter to the street. If a city utility worker tests your house for leaks and finds a drop in air pressure he will simply shut off your gas and instruct you to call a licensed plumber and obtain the necessary city plumbing permit. After obtaining the necessary city permits you will be given an inspection appointment after correcting the problem keeping in mind that building inspection staff has been reduced considerably by the city manager and city council. So much for safety. Regarding placing a gas line under a house slab, California Plumbing Codes never have allowed gas lines to be placed below home slabs and until recently only have been unfortunately allowed by the city of palo alto inspection using a sleeved vented system on a case-by-case basis to appear customer friendly. So much for safety. ufo, you are right - the reason I listed procedure was so some plumber would not catch hell for taking more that a half hour. On my designs my policy has always been to get gas pipe out of the ground. I have seen the damage that can occur with wrapped pipe that lacks cathodic protection. Sleeveing is a last resort. What exactly happened with Dahl plumbing? Why. Does anyone know of a house withanunder slab gas line? I thought it was under dirt, to the meter. By the way, what happens when an electrician installs a new line, conduit, a new electrical panel, but knowingly does so without permit or inspection? Is that like a car mechanic, where you have to have a contract signed in advance, be offered old parts, and if they do not use a permit and get an inspection and sign off, do they have a right to be paid before that is done? Re: Dahl. My understanding is that they invested too much in construction, and the decline took them under. As to non-permit work, The city has the power to force you to make a late submission for permit and inspection. This can be expensive. I don't know whether bungalow hoppers explain the consequences of no permit to their customer or not. The fact that non permit work is common is an argument for reducing the pedantic chicken that usually accompanies a permit application. In the days when a building inspector had to be journeyman in the field he inspected, the counter check was common. Now that plan check specialists lack actual experience there is a tendency to critique form rather than substance.